At RGV Cosmetic Surgery & Vein Center, we are able to offer exceptional care and flexible treatment options thanks to our dedicated and highly trained staff. Patients in Brownsville, the Rio Grande Valley, McAllen and all of South Texas can trust these professionals for all of their cosmetic needs. Certified Registered Nurse Anesthetist since 2014. Viridiana “” Ortiz is a native of Brownsville, TX. She completed her education as a Certified Medical Assistant at South Texas Vocational Institute. 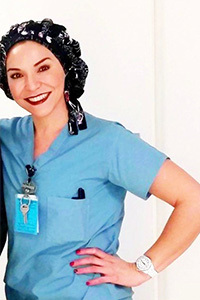 She has been working with RGV Cosmetic Surgery and Vein Care since graduating, and she has been a very special part our team working as our pre-operative and post-operative assistant, both for cosmetic surgery and varicose vein patients. Viri then chose to dedicate her talents as a laser technician in our MedSpa. To this end, she completed additional, comprehensive training at the National Laser Institute in Dallas and is a licensed laser technician. Viri specializes in laser hair removal, photofacial and fractional laser for skin rejuvenation, chemical peels, Venus Freeze radiofrequency skin tightening treatments, microdermabrasion, and Advanced Obagi skin care. To learn more about our qualified staff or schedule your consultation, contact us today. At RGV Cosmetic Surgery & Vein Center, our team is proud to serve residents of the Rio Grande Valley, Brownsville, McAllen, and all of South Texas.